The former Brexit secretary believes Mrs May’s proposals leave Britain worse off than remaining in the EU, and it was time to take back control of Brexit. Arch Eurosceptic Mr Davis quit the Cabinet after the Prime Minister’s blueprint on leaving the EU was announced in July. Now he is ready to ramp up the pressure on Mrs May when parliament returns, with a Brexit deal possibly facing a Commons vote as early as October. Mr Davis told BBC One’s Andrew Marr Show: “It would be rather odd for me to resign over something and then vote for it when it came back. He added: “We will be under the rule of the EU with respect to all of our manufactured goods and agri-foods, that’s a really serious concession, what about take back control, it doesn’t work. Mr Davis also claimed concerns over the Northern Ireland border were “heavily over emphasised”. The Republic of Ireland and the UK could hammer out a plan “if we put the political will behind it”, he added. 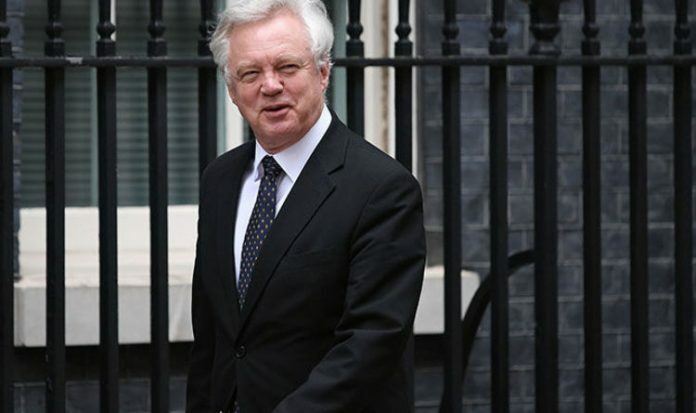 Mr Davis also suggested he quit the Cabinet after clashing with Mrs May on the government’s Brexit strategy. He said: “I was always the Brexit Secretary, the question is whether I controlled events, that’s another matter. It comes as Michel Barnier turned up the heat on Mrs May, launching a stinging attack on her Chequers trade proposals. Mr Barnier said the plans would spell the end of the single market. He told German newspaper Frankfurter Allgemeine Zeitung: “If we let the British cherrypick which of our regulations to follow, that would have serious consequence.